Inside 102 JAMZ. Photos by Mike Tambashe. Khalid is not the first artist that 102 JAMZ has helped breakthrough on radio. Big Mo rattles off others that owe their success, in part, to the station: Dae Dae, K Camp, Kent Jones, O.T. Genasis, Que, Russ, TK N Cash. These artists span from R&B to rap, but the common thread is that they were all broken on 102 JAMZ—not Atlanta, the consensus center of rap music; not New York City, the birthplace of the genre; not even Los Angeles, the real home of most rappers big enough to make it on radio. Those cities have their own rap industries, but for an artist looking to breakthrough in the South—and hopefully the rest of the nation—the best place to start is in Greensboro, North Carolina. Jeff Anderson, a former 102 JAMZ Production Director who now works at Charlotte’s WPEG Power 98, credited the station’s success to the atmosphere it created in the early 2000s. “It was a station that was heavy in the street and a 24/7 party.” That assessment still resonates today. “You might flip to another radio station and they may cut out certain lyrics,” says DJ Lil Vegas, but 102 JAMZ tries its best to preserve the songs. This provides listeners with a better music experience and, combined with the station’s lively hosts, it provides an energy to the station that might otherwise fall flat. 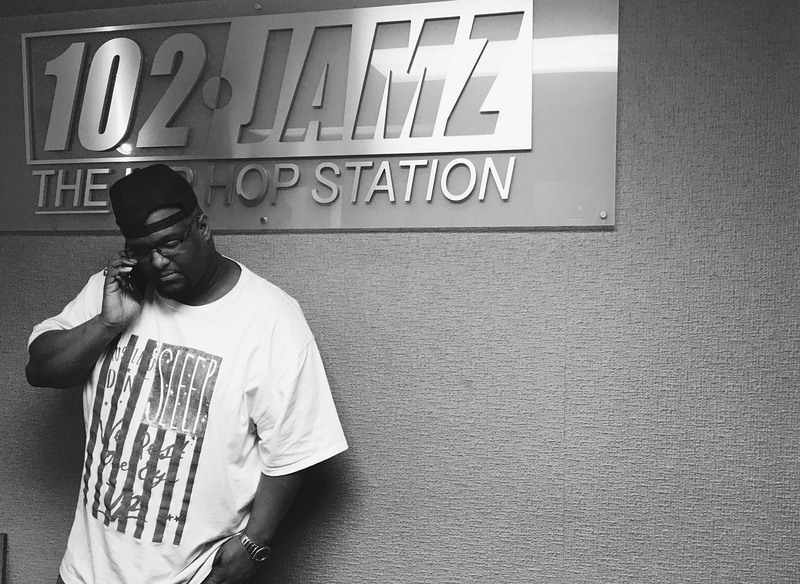 “He’s one of the quiet ones,” DJ Lil Vegas tells me over the phone when I ask about the 102 JAMZ Program Director, Brian Douglas. “He barely talks, barely takes pictures. He likes to stay behind the scenes.” Douglas may be elusive—many interview requests went unanswered—but his vision for the station is clearly to appeal to young people, and especially young Black consumers. Commenting on the ease of working with Douglas, Mo says, “All I gotta do is tell Brian, ‘There’s a brand new artist and the song is great’, and he’ll be like, ‘You think it’s a hit, let’s go with it.’” The station’s Mixshow Coordinator, J Flex, praises Douglas for improving his own skills as a DJ. Despite his reclusion, current and former co-workers all point to Douglas for molding the station into the success it is today. 102 JAMZ got started in 1989, after petering out as a country music station. In 1990, Douglas took on the role of Program Director and led the station in a concerted push to focus on the 18-34 age demographic. By 1999, 102 JAMZ overtook WTQR (104.1), a country station, as the top station in North Carolina’s Triad area, a crown that WTQR had held since the ‘70s. By the end of 1999, Entercom Communications bought 102 JAMZ, along with a few other stations, from Sinclair Broadcasting. Not even within eyeshot of the Greensboro skyline, the 102 JAMZ studio is located in a sprawling corporate office park shared by other Entercom-owned stations. Technicolor paintings of various hip-hop stars line the walls. Inside, the studio is full of microphones, monitors, and a little space for DJ turntables. The morning shift is occupied by the 3 Live Crew information and entertainment show, and then Big Mo’s show goes on from 10 a.m. to 3 p.m. Toshamakia takes over in the afternoon, Fat Jeez in the evenings, then Showdown takes the overnight shifts. Where other stations might offer syndicated programming for some of these time slots, 102 JAMZ holds down with live DJs every hour and keeps it local to the Triad community. “The 28-up range, they’re really gonna think what’s hot based off of what 102 JAMZ is playing,” says Tune, one of the on-air personalities. “But that younger demo [18-24] is creating what’s hot and pushing necessarily what gets played.” Tune started as an intern at the station in 2014 and now works part-time during the early morning shift. Even at just 23 years old, he is starting to feel his personal tastes skewing a bit older than the station’s prime target demographic. Luckily, the station’s employees are always ready to hear about potential new records from younger people. Big Mo recalls first hearing about New Jersey-raised rapper Fetty Wap from a station intern in the summer of 2014. This was months before any of his singles hit radio. After making a trip up to New York City and seeing Fetty Wap’s songs go over so well, Mo came back ready to push for the rapper. Every Monday, the station holds weekly music meetings to look at the songs in rotation, assess how they are doing, and decide what might need replacing. The music team determines the success of songs based on phone-in requests and their own in-house surveys of listeners. They also check the rankings provided by Shazam, an app that uses a smartphone’s microphone to identify songs as they are playing. If a song isn’t getting Shazam’d, this might mean it isn’t quite clicking with their audience. On the other hand, if many users consult the app about a particular song, it could mean that they like what they are hearing, but the artist hasn’t been heavily promoted yet. This information helps 102 JAMZ get ahead of the curve. Chuckling, Big Mo recalls how a record label began pushing “Unforgettable” by French Montana and Swae Lee, but the station had already played out the song when it leaked months earlier. Peers of 102 JAMZ might have access to all the same information, but no one else acts on it with their tenacity. That’s an ethos he’s tried to instill in artists who look to radio as the end goal of success, telling them that their music needs to be in the clubs, on the Internet, and on airways beyond 102 JAMZ. He may have the power to give their careers a spark, but they need to understand how to keep the flame going. The station’s authoritative and leading voice can result in records being pushed on them, not from artists or their labels, but from other DJs who can’t breakout a record at their own station. DJ Lil Vegas recalls how he broke “Foreplay,” by Charlotte-based rapper Jalen Santoy, on the air. A DJ from another North Carolina station approached Vegas. “‘If y’all can start playing this and get it in rotation, then we can start playing it down here at our station,’” Vegas said the DJ told him. Vegas took the DJ up on the request and the breezy rap song entered his mixes, then 102 JAMZ’s regular circulation, and then it started receiving play around the state.